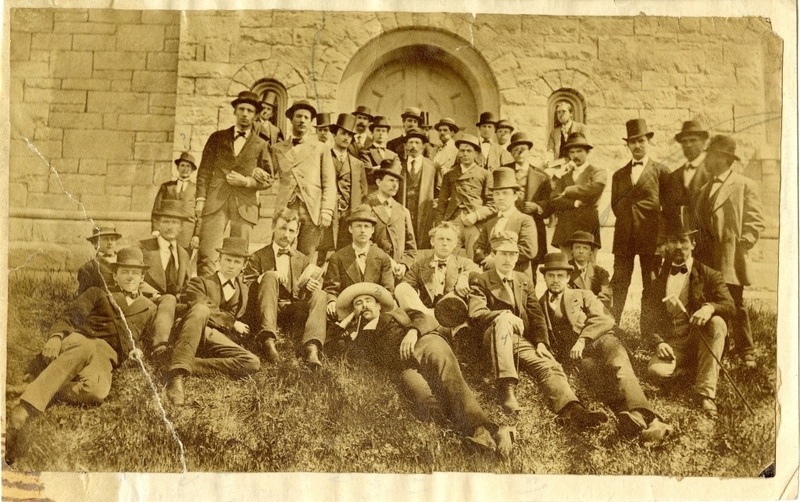 Group portrait of the Bowdoin Class of 1874 in front of the chapel. Front row (left to right): Charles E. Smith, Frank Wheeler, Rotheus A. Grey, Edward O. Howard, Marshall W. Davis, Daniel O.S. Lowell (with cane). Second row (left to right): Pike, Unknown, Arthur L. Perry, Henry K. White, Ernest S. Hobbs, Albion G. Bradstreet, Charles J. Palmer. Third row (left to right): Willard R. Hemminway, Horace W. Philbrook. Fourth row (left to right): George B. Wheeler and Don A.B.H. Powers (arms locked), Charles F. Kimball, Samuel V. Cole, Frank W. Hawthorne, Elbridge Gerry, Henry G. White, Walter T. Goodale, Ira S. Locke, Jesse P. Bickford, George M. Brock. Back row (left to right): Henry Johnson, William M. Payson, Thomas C. Simpson, William H. Moulton, Cassius M. Ferguson, Harry V. Moore, Unknown. Levi H. Kimball and Hannibal H. Emery are in the windows.